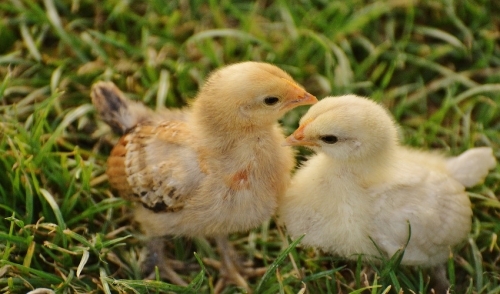 Chicks and chickens need stimulation and entertainment to stay healthy, and a healthy, happy chicken is one that will behave better, lay more eggs, and be a more pleasant barnyard or backyard companion. Fortunately, there are many easy ways to keep chicks entertained that don't require expensive equipment or elaborate assistance. Boredom can affect chickens in several ways. While general listless behavior is not necessarily bad, a bored, unhappy chicken can develop poor behaviors such as pecking or aggression, causing problems in the flock. Bored hens typically lay fewer eggs, and bored chickens will not be as alert to potential predators. Boredom can lead to stress, and stressed birds are more susceptible to a wide range of illnesses and poor health, but by keeping chickens entertained, the flock will be healthier and happier. With just a few simple materials and creative thinking, it's easy to keep hens, roosters, and chicks entertained. Perches: Chickens get a new view of the world with a new perch, and they will climb and explore different levels of perches. Stumps or sturdy branches can be added to the coop, or simple A-frame perches are suitable. Moving perches occasionally will continue to hold chickens' interest. Mirrors: Adding reflective objects to the coop will entertain chickens as they watch or chase the dancing lights or interact with their own reflections. Hanging old CDs or small mirrors out of chickens' reach is a good option, or mount a sturdy mirror to a pole or post where they can see it. Be sure to use unbreakable mirrors, however, so chickens do not get injured by broken glass. Treat Cakes: Dense feed cakes that include suet, poultry feed, dried fruit, nuts, and other treats will offer chickens something unique to peck as they seek out their favorite bits. Moving the cake to different areas will help keep the birds interested in it until they have finally eaten it all. Tetherball Toys: Chickens love to peck, and if what they are pecking moves, so much the better. Hang an edible treat from a chain or rope into the coop, and let them peck at the makeshift tetherball, chasing it around as it moves. A head of lettuce or cabbage, several apples, or melon rinds are all great options. Peanut Butter Logs: Spread chunky peanut butter on an old stump, and press a little cracked corn or poultry feed into the peanut butter before adding it to the coop. The birds will happily peck at the log, and may climb or perch on it as well, adding even more entertainment to their day. Leaf Litter: In autumn, add a pile of leaf litter to the coop for chickens to scratch through and peck. They will seek out natural insects and seeds in the leaves, and adding a few grapes, peas, or cranberries will give them extra treats to search for. Dust Bath: Chickens love to dust themselves, and a dust bath area will give them a dedicated place to enjoy. Keep the soil in one part of their pen or coop loose and fine, adding some sand to it occasionally to keep it in bathing condition. The birds will also scratch through the area, and the dust baths they take will keep their feathers in better condition. Seed Toys: Add birdseed, cracked corn, or fine poultry feed to any object the birds can peck and roll – an empty bottle or an old plastic Easter egg is a great choice. Drill or poke several holes through the container, large enough for seed to escape, and toss it into the pen. The chickens will investigate the object, and when they discover they can roll or move it to release treats, they will be entertained for hours. Straw Maze: Give chickens new places to explore by creating a simple straw maze in their pen. One bale will provide a distraction as the birds peck it or perch on it, but several bales will create nooks and crannies for them to explore over and over. Alfalfa bales are also great options that add extra nutrition. Warm Treats: Spice up your chickens' day by preparing them a warm treat on cold days. Warm, softened lentils, beans, split peas or grains such as quinoa are tasty options the birds will fall over one another to enjoy. The most important thing to remember to keep chickens entertained is diversity – offering the same distraction day after day will cease to be effective as the chickens get used to the game, toy, or treat, but by changing the options, the birds will always have something new to look forward to.